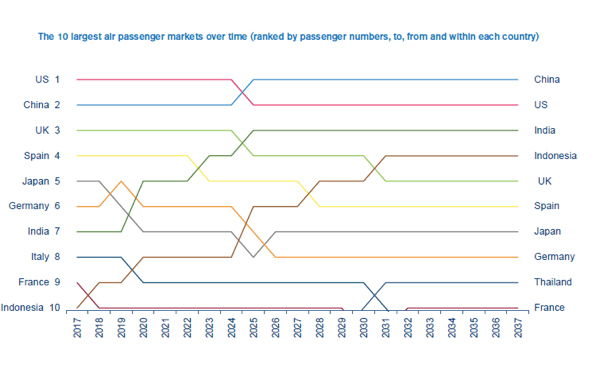 The latest update to IATA's 20-Year Air Passenger Forecast, shows that an increasing shift Eastwards in the center of gravity of the industry is behind the continued strong growth. Over the next two decades, the forecast anticipates a 3.5% compound annual growth rate (CAGR), leading to a doubling in passenger numbers from today's levels. 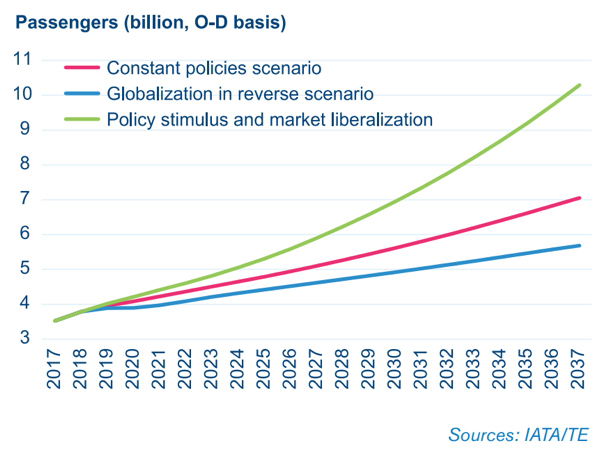 China will displace the United States as the world's largest aviation market (defined as traffic to, from and within the country) in the mid-2020s. The rebalancing of China's economy towards consumption will support strong passenger demand over the long term. Indonesia is forecast to be a standout performer-climbing from the world's 10th largest aviation market in 2017 to the 4th largest by 2030. Copyright 2018 International Air Transport Association. All rights reserved. From https://www.iata.org.